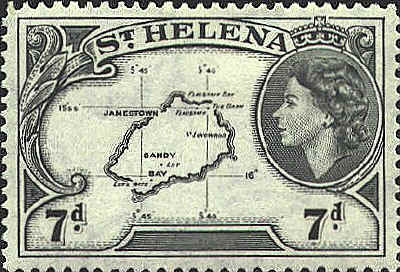 St. Helena is a British Crown Colony. 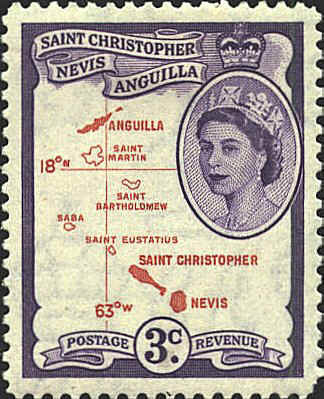 St. (Kitts) Christopher, Nevis, Anguilla was one of the presidencies of the Leeward Islands until it became a separate colony in 1956. It achieved internal self-government in 1967. The stamp was issued in 1954. 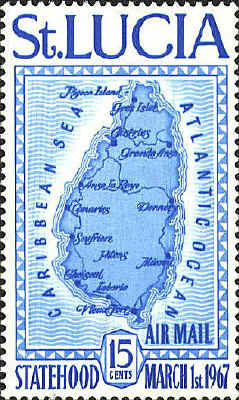 And earlier stamp with the same map was issued in 1952. The stamp below is one of a set of three. Similar sets were also issued for Antigua, Jamaica, and Trinidad & Tobago. The other values will be seen there. Formerly a British colony St. Lucia became an associated state in 1967 and independent in 1979. The stamp was issued in 1967 to celebrate independence.